The Ruvin Bun Award | Remembering Litvaks, Inc.
Each year, a committee appointed by the Rokiškis Regional Museum confers the Ruvin Bun Award to an individual or group for increasing the awareness in Lithuania of the contributions of its Jewish citizens in the establishment and growth of the country. The award is named for Ruvin Bun, a Jewish volunteer who fought in Lithuania’s wars of independence and died at Giedraičiai. 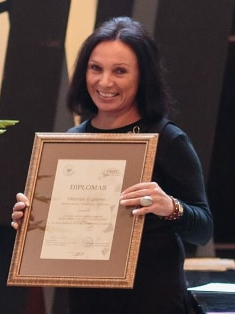 The award program coincides with the 100th anniversary of the 1918 founding of the modern Lithuanian state and considers research and educational programs that reflect the original vision of the Lithuanian state as a tolerant, multi-cultural society with a western-style constitution and established democratic government. Private Ruvin Bunas, who was also known as “Rufka” Bun, was born on July 20, 1902, in Pasubate, in the Novo-Aleksandrovk uyezd of the Kovna Gubernya / Province, and lived in Aleksandravėlė, Rokiškio Uyezd (about 8 kilometers southeast of Obeliai). He volunteered to serve in the Lithuanian army on July 11, 1919, and was killed at the battle of Giedraičiai, on November 21, 1920, the last day of the Lithuanian-Polish War. Eilinį Ruvin Bunas (taip pat žinomas kaip Rufka Bun), kuris gimė 1902 m. liepos 20 d., Pasubatėje, Novo-Aleksandrovsk ujezd ir gyveno Aleksandravėlėje, Rokiškio apskr. (ujezd). Tai yra apie 8 km į pietryčius nuo Obelių. 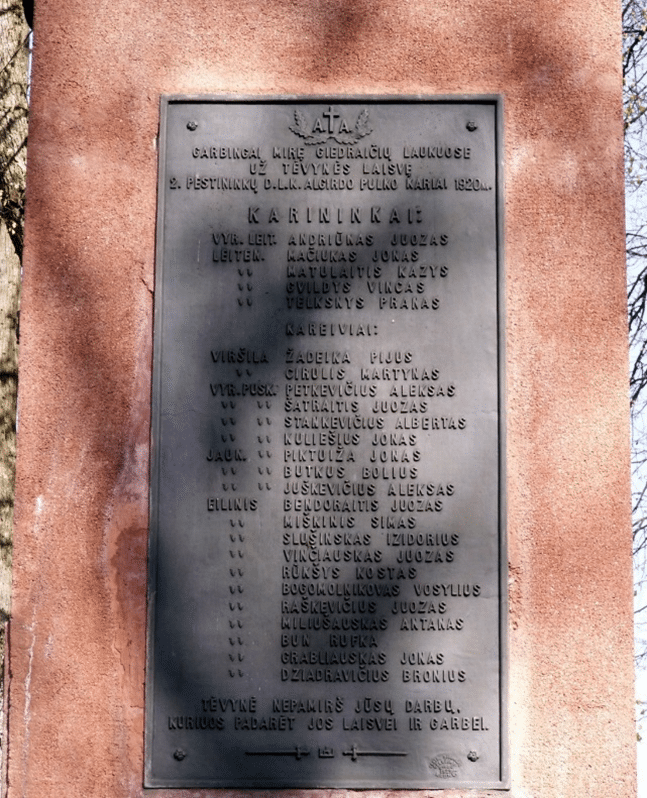 Jis tarnavo savanoriu Lietuvos kariuomenėje nuo 1919 m. liepos 11 d., ir žuvo mūšyje ties Giedraičiais 1920 m. lapkričio 21, paskutinę Lietuvos-Lenkijos karo dieną. In independent Lithuania, an individual who was a “savanoris,” a “volunteer” who helped defend the country in the period 1919 and 1920, was held in high esteem. In this article, Ettie (Sidrer/Santocki) Zilber, Ed.D., explains how the savanoris medal won by her grandfather spared him from execution in 1941, Jewish Volunteer Jakūbas Santockis. 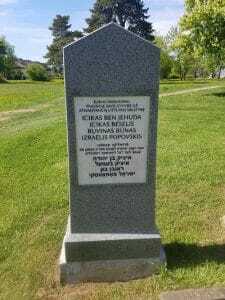 This memorial, which is dedicated to Ruvin Bun and three other Jewish savanorai (volunteers) who died in Lithuania’s Wars of Independence, was unveiled on May 8, 2018. The photograph was taken by Ana Maisel and posted on Facebook by Hon. Amir Maimon, the Israeli Ambassador to Lithuania.